An important specification to understand when evaluating oscilloscope performance is the waveform update rate which is expressed as waveforms per second. While the sample rate indicates how frequently the oscilloscope samples the input signal within one waveform, or cycle, the waveform capture rate refers to how quickly an oscilloscope acquires waveforms. All oscilloscopes have an inherent “dead-time” between each waveform acquisition, when it is processing the previously acquired waveform. During the oscilloscope’s dead-time, any signal activity that may be occurring will be missed. Because of oscilloscope dead-time, capturing random and infrequent events becomes a matter of statistical probability. The more often a scope updates waveforms for a given observation time, the higher the probability of capturing and viewing an elusive event. Oscilloscopes with high waveform capture rates provide better visual insight into signal behaviour and dramatically increase the probability that the oscilloscope will quickly capture transient anomalies such as jitter, runt pulses and glitches – that you may not even know exist. USB 2.0 deep memory models (PicoScope 3000/4000/5000 Series) to 80,000 wfms/s. USB 3.0 SuperSpeed deep memory models (PicoScope 3207 & 6000 Series) to 100,000 wfms/s. * Depends on host PC performance. See benchmark table for measured performance of specific PicoScope models. The animation to the right shows a 5 MHz clock signal with infrequent glitches captured on a PicoScope 6404D. The glitches occur approximately 25 times per second. Total capture time for each acquisition is 1 µs, so the probability of capturing the glitch with each capture is just 0.000025. But with a waveform update rate of more than 100 000 waveforms per second the scope will capture this glitch within 0.4 seconds on average. In this example, the scope captured the error several times in less than 3 seconds. 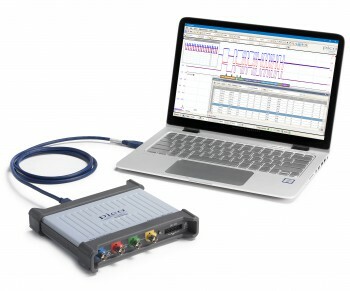 Pico was the first company to introduce such fast waveform update rates to PC oscilloscopes. Our waveform update rate outperforms all other PC oscilloscopes and many traditional benchtop oscilloscopes costing considerably more. Listed below are some example specifications for maximum waveforms per second together with the test conditions used. Note that for applications that require even faster waveform capture, most of our oscilloscopes have a rapid trigger (segmented memory) mode that can collect bursts of waveforms at rates as fast as 1 million per second. Note 1: Test conditions. PicoScope software set to fastest timebase in persistence mode, input signal > 10 MHz. PC used running Windows 8.1 on an Intel i5-4750 @ 3.25 GHz. Note for existing PicoScope users: you too can enjoy improved fast waveform capture rates. Simply download and install the latest version of PicoScope software.